The Mao Portrait Suite was printed in 1972 by Styria Studio, Inc. New York. The portfolio consists of 10 screen prints on Beckett High White Paper. There are 250 prints hand signed and numbered in ball-point pen with a rubber stamp on the verso. A suite recently sold at a Christies Auction for USD $1,207,500 (including buyer’s premium). Prints have always been popular art pieces to collect, in part because of how reasonably priced many of them can be found. They provide a great entry point for beginners and can also complement a seasoned buyer’s collection. When it comes to affordability, the signed limited edition print, may be a very different matter altogether - subject to a wide range of factors. What is a signed, limited edition print? As the term suggests, these are prints that are produced in limited quantities - for instance, between 10 and 850 - as opposed to open edition prints, where the same plate or image may continue to be printed for as long as there is demand for it or the plate remains in printable condition. 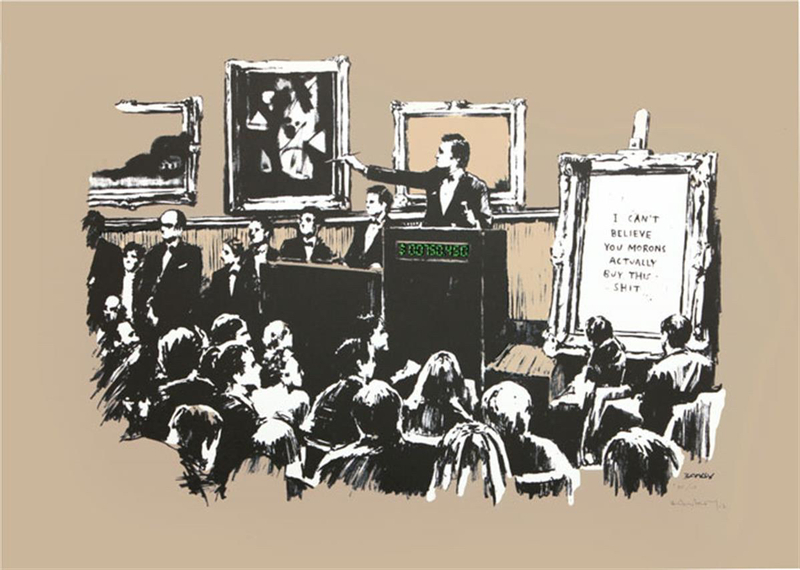 When limited edition prints are also signed by the artist, its price may be two or more times higher, the artist also often marking the limited edition piece with a number (the print run number) to ensure authenticity - '50/100', for example, denoting the 50th print in a 100-print production run. As an example, Marc Chagall’s series of prints called ‘Daphne and Chloe’ can be found is signed and unsigned versions. Those that are signed are worth 10 times as much as those that are unsigned. Otherwise, they are the same prints. Street artist Banksy is another great example. His signed and numbered prints are of a much higher value than his unsigned work. If there are only 10 prints total in an edition, each print generally becomes very valuable. If there are 7,000 prints available in the total print run, well, maybe not quite... If 6,999 other walls across the planet have the same print as you do, exclusivity / rarity is no longer a consideration. Are such prints automatically valuable? A signed, limited edition print certainly could be worth a great amount, but much depends on its rarity, the reputation of the artist and various other factors. There is sadly no guarantee that a signed limited edition print will be valuable - the artist or style may have fallen out of fashion for example, meaning that there is little market for the print. On the flip side, you could be sitting on a small fortune! What other characteristics affect value? You might have imagined that age would help to bump up the value of such a print. However, this is not necessarily so, as shown by the abundant numbers of prints on the market by obscure 19th century artists that only tend to be worth something if the subject is of particular commercial appeal. Are you looking at an ‘original print’? These include etchings, lithographs, engravings, lino cuts, woodcuts and silkscreens where the artist has personally worked on the piece, versus a collotype (for example) which is a photomechanical reproduction of a work of art. Provenance will also play a part in helping to determine a print’s value. Provenance is the record of ownership, or a historic record of the various owners of a work of art. Certificates of authenticity with limited edition prints, invoices, receipts and any other proof of purchase can be used as provenance. Quality, condition and size are other factors that can greatly impact the value of a signed limited edition print. Was the print made by a particularly sophisticated and popular process for example? Take a look at the condition of the paper. Is it pristine or do you see tears, creases, stains and dirt? How about a watermark (as in an identifying mark and not someone’s spilled apple juice) or distinguishing markings on the paper? Faded colours can also significantly damage the value of a limited edition signed print, as could a bad attempt at restoration or other stains or markings. 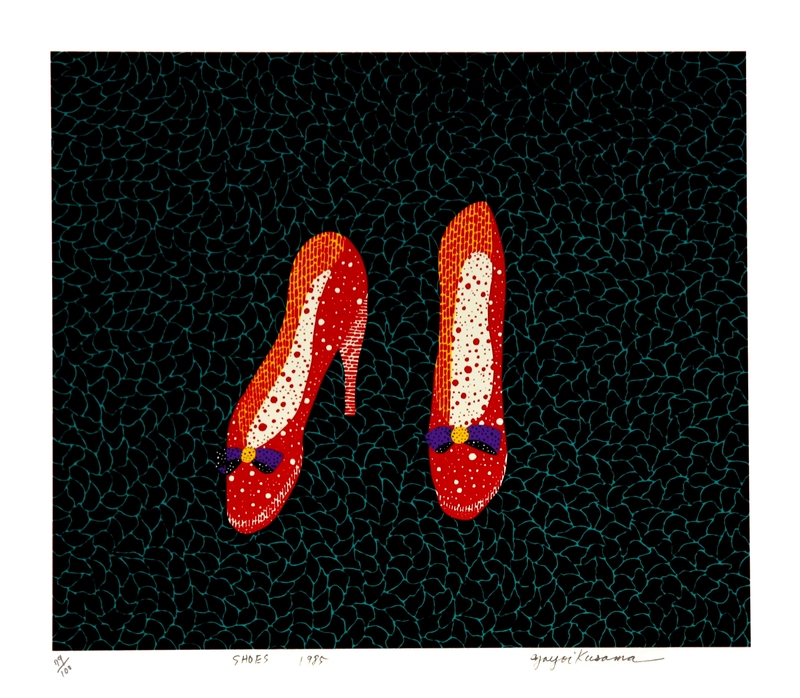 “Shoes” by Yayoi Kusama, hand signed and numbered, limited edition serigraph on paper, #79/100, 1985, 45.5cm x 53.0cm; mint condition, recently sold at an ArtNet Auction for USD 12,000 (hammer price). How can I determine the exact value of a print? All other things being equal, a signed limited edition print - particularly by a well-known artist - will be much more valuable than an unsigned, open edition one. But to ascertain a piece's real worth, you may need to do a lot of research, comparing the piece to others that have been sold from the same production run (auction catalogues can be a great help here). A limited edition print being both signed and numbered can be a great indication of authenticity, which in turn, can make it easier for you to determine the art's value. While a signed limited edition print can certainly make a greatly valuable collector's item compared to a similar unsigned and open edition print, there are many other factors that can impact value that you should thoroughly investigate before coming to any premature judgements about a given piece. Lastly, value is in the eye of the beholder. One man’s Picasso is another’s scribble. So remember to buy what you love (and can afford) and regardless of its value, you’ll enjoy seeing it on your wall for years to come.